A few months ago I wrote about a fluke that gets in the eyes of small fish and how it obscure its host's vision and alter its behaviour - but the eyes are just one step away from the brain where a parasite can potentially do more to mess with the host's behaviour, and a fish's brain is where the parasite being featured in today's post is found. This study is on a species of fluke which has been. found in the brains of some small Australia fish call Galaxias. The presence of such parasites in galaxias has been known for years, and researchers have come across galaxias having a enlarged head, or a head full of "white balls". It was assumed to be caused by some kind of parasite, but this was never properly investigated. 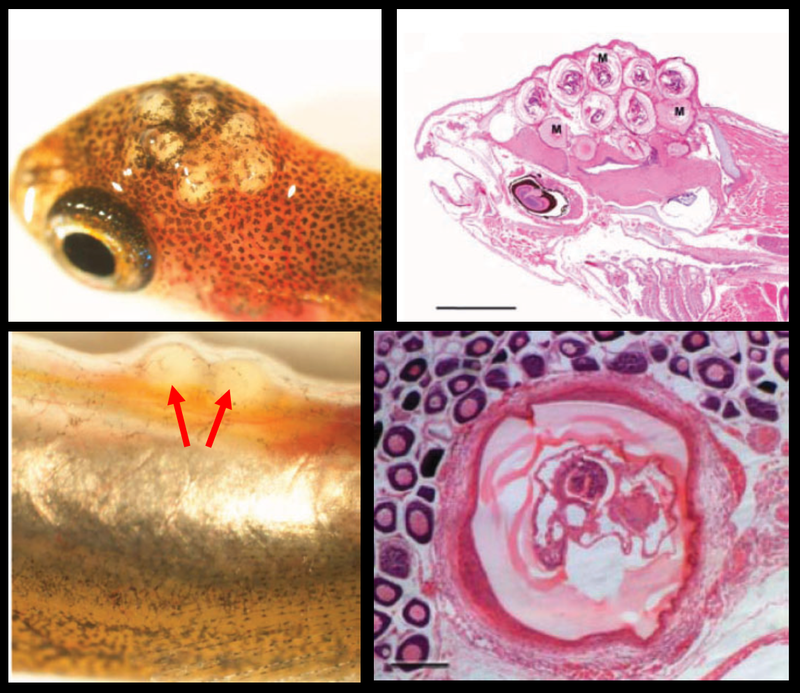 In this recent study, scientists used histology and genetic markers to identify the parasite that is giving these fish their big heads. The galaxias used in this study were a subset of specimen collected as a part of a large study looking at the population genetics of these fish. Of the 66 sites where galaxias were collected, the parasite was found to be present in fish at five of those sites, though it was not particularly common, with only one to five infected fish out of each standard sample of thirty fish per site. It turns out that the parasite which were causing some fish to have bulgy heads was a parasitic fluke - Apatemon gracilis. Having a head filled with parasite cysts would probably compromise the fish's ability to survive, and the "white cap" of parasitised fish might be a big "eat me!" sign to potential predators - such as the parasite's final host which are known to be various species of fish-eating ducks. At this point, it is uncertain if the presence of the flukes would change the fish's behaviour in a way that is meaningful for the parasite's life-cycle. While it may seem intuitive that the parasites on the brain are in control, that is not necessarily the case. Sure, some brain-encysting fluke have been documented to mess with their host's behaviours in a way that enhance their likelihood of ending up in the final host. But in others, timing of behavioural change onset indicates that behaviour changes are a side-effect of the parasite's growth, and by the time the parasite is ready to be eaten by a predator - just when you'd think it'll be helpful to have behavioural changes kick in - the fish has gone back to acting as it was before the infection. We won't know exactly what A. gracilis does to its fish host without further investigation, but for now, at least the cause of the enlarged fish head has been resolved. The presence of parasites in these galaxias fish are not just a mere academic curiosity - both dwarf galaxias (Galaxiella pusilla) and the little galaxias (Galaxiella toourtkoourt) are threatened species of conservation concern, but we know next to nothing about their parasites. If certain population are more heavily infected with A. gracilis, then they might also be more readily affected by any environmental disturbance. Knowing what parasites might be lurking in the background can give us some ideas to what might tip the balance. Coleman, R. A., & Hoffmann, A. A. (2016). Digenean trematode cysts within the heads of threatened Galaxiella species (Teleostei: Galaxiidae) from south-eastern Australia. Australian Journal of Zoology 64: 285-291. The words parasite and lice regularly go hand in hand, and usually brings us dreaded flashbacks to those primary school days when our parents would rigorously comb and shampoo our hair trying to rid of us those nasty headlice! Well unfortunately for Scandinavian brown bears, lice may impose a bigger problem than just an itchy head as a team of Swedish scientists found out in their recent study. Trichodectes spp. hit the limelight when these “pests” were discovered in our beloved pets, often resulting in scratching, sleeplessness and nervousness in man’s best friend. This lead to the cull of Trichodectes canis from dogs in the western world through veterinary practices. However, Trichodectes don’t just occur on dogs, with previous studies discovering 16 species within this genus (no doubt there are hundreds more waiting to be discovered!) parasitising ungulates and carnivores worldwide. Trichodectes pinguis are chewing lice or biting lice of brown bears, although this name suggests they bite and chew their host, they actually feed on their dead skin and other skin products.The side effects caused by this feeding can be major irritants to brown bears as you’ll see later. These are permanent ectoparasites that stay their entire lifecycle on their host, and are highly specific to brown bears. They get transmitted between bears through direct physical contact during mating, fights, and mother-offspring contact. In the April of 2014, a 5-year-old female brown bear was captured by scientists in south-central Sweden under the Scandinavian Brown Bear Research Project and after extensive examination, patches of baldness were discovered on its neck and upper part of its chest. This was caused by, you guessed it, those foraging little critters. 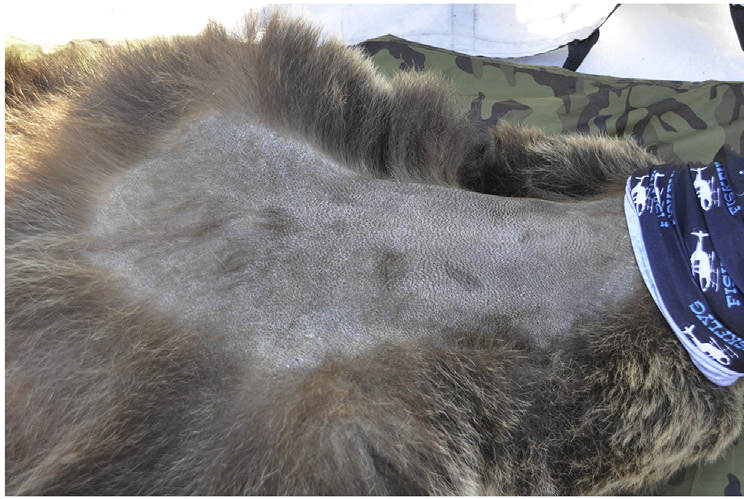 Similar but more extreme cases were observed in two male bears the following year who had extensive patches of “bearness” throughout their bodies. 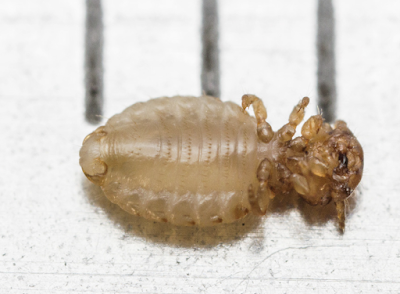 Moderate to high numbers of these tiny lice were found in the hair surrounding the affected areas. The affected areas showed signs or hyperpigmentation, lichenification, and in some cases chronic dermatitis indicating inflammation, pruritus and severe scratching, so pretty nasty hey! We all know the feeling of having an itch that just won’t go away, now imagine that on most of your body. Interestingly, hair samples collected from nearby brown bear day beds (hidden resting places) were found to contain lice too. Mammals often carry considerable numbers of ectoparasites without any major effects to their health, yet more intense infestations as observed on those brown bears can have detrimental effects to the host. These severe louse infestations can make bears more susceptible to secondary infections and negatively alter their behaviour with restlessness, scratching, reduced feeding times and high levels of stress being just some examples. Finally, if those weren’t bad enough, excessive hair loss may affect thermoregulation of the animal especially during times of high energy expenditure such as reproduction and hibernation. It would be pretty chilly going to sleep on a cold winters night without your warm woolly duvet alright! So I think it’s safe to say we didn’t have it too bad with those pesky headlice when you think about what the poor Scandinavian brown bears have to deal with! Esteruelas, N. F., Malmsten, J., Bröjer, C., Grandi, G., Lindström, A., Brown, P. Swenson, Jon E., Evans, Alina L. Arnemo, Jon M. (2016). Chewing lice Trichodectes pinguis pinguis in Scandinavian brown bears (Ursus arctos). International Journal for Parasitology: Parasites and Wildlife 5: 134-138.